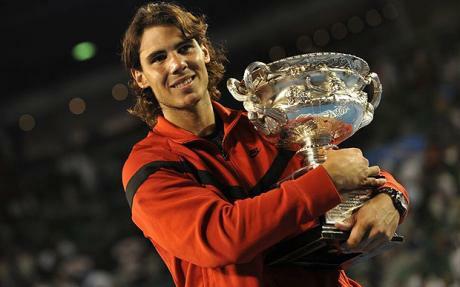 Spain's World number 1 Rafeal Nadal and women's World number 1 Denmark's Caroline Wozniacki has been named International Tennis Federation world champion for 2010. Nadal in 2010 had the sublimest of the forms. He en-route won French and US opens, and Wimbeldon, which ultimately led to acheieve the Career Grand Slam. This also made him the youngest to achieve this feat, and only the seventh in the world. He was also successful in achieving World number 1 ranking and de-throned Roger Federer.He in 2009 had a terrible year,got his number 1 rank stripped,losing his French Open streak,and also unable to defend Wimbeldon title due to injury.So it was a excellent turn around in his overall playing form. "It is an honour to be named world champion for the second time," he said. "My goal all the time is to keep improving and be a better player each year than I was the previous year." Wozniacki on the other hand in the process moved Serena Willams from the prime position.She did not win a Grand Slam in 2010, but still managed to win six trophies in her kitty. "To be listed with all the former world champions is something I'm really proud of," said Wozniacki.